Morale at the Department of Agriculture's legal department is sliding, a survey suggests, and the union representing workers there puts some of the blame on the official who was nominated to lead it. 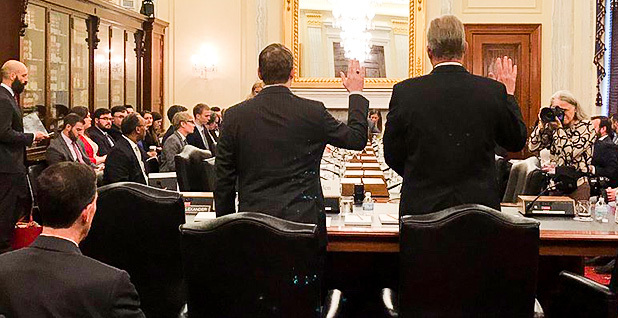 The USDA Office of the General Counsel's low rank on a survey of employee satisfaction comes as Principal Deputy General Counsel Stephen Vaden's nomination to the general counsel's slot remains idled in the Senate. The office ranked 254th out of 339 subcomponents of federal agencies on the "best places to work" survey conducted by the Partnership for Public Service and Deloitte in 2017. Its score, based on a weighted formula of three questions in the federal government's broader annual survey of employee satisfaction, fell 8.6 percent from a year earlier. Among the low points: respect for senior leadership, on which the agency ranked 321st out of the 339 offices considered — a decline of 16.7 percent in one year. That question "measures the level of respect employees have for senior leaders, satisfaction with the amount of information provided by management and perceptions about senior leaders' honesty, integrity and ability to motivate employees," according to a description on bestplacestowork.org, which posted the results. A legislative and political organizer for the American Federation of Government Employees, Jeff Streiffer, called the OGC survey results "abysmal" and said poor employee morale might give senators cause to worry about the nomination. The AFGE opposes Vaden, questioning his support for collective bargaining while he's led the office on an acting basis. "If the Senate is concerned about that, they have good reason to be," Streiffer said. Of 14 categories, only one — pay — didn't show a decline in score. Pay was unchanged from a year ago. The Agriculture Department overall, however, showed an improved score in the survey. The Office of Personnel Management, which has touted improvements in the score in recent years, this time didn't say much, quietly releasing survey results in the last month, Streiffer said. The Senate delay may be in part due to expectations that Vaden's confirmation won't come swiftly. Senate Agriculture Chairman Pat Roberts (R-Kan.) told E&E News last week that Democratic objections are likely to prevent a quick voice vote on the nomination, and that he's discussing with colleagues how best to move forward. "It's going to be difficult to move him forward the way we've been able to get some others through," Roberts said. "I'm glad you asked me that question. I've got to go back to these same people and see where are we." Roberts said the nomination "has been held up far too long." Some farm groups, including the National Pork Producers Council, have urged Senate leaders to push through the nomination. A spokesman for Senate Majority Leader Mitch McConnell (R-Ky.) said yesterday that he didn't have any schedule announcements beyond other issues — a financial regulation overhaul, an omnibus spending bill and a nomination to U.S. Customs and Border Protection — for the next two weeks. The Agriculture Committee approved Vaden on a largely party-line vote in December. Several Senate Democrats raised questions or objections to Vaden's nomination, citing his past work on laws requiring voter identification that they say suppressed low-income or black voters who are more likely to support Democrats, and his role in transfers of USDA career employees. The committee's ranking Democrat, Sen. Debbie Stabenow of Michigan, has said senators want to know if political motivations were behind the transfers (E&E Daily, Dec. 12, 2017). Stabenow said last week that although Democrats won't give unanimous consent on the nomination, "no one's objecting to moving forward on a vote." 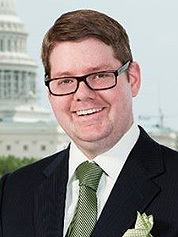 Vaden from Tennessee was formerly an associate at Jones Day and Squire Patton Boggs. Among Democrats who were particularly tough on Vaden at his Agriculture Committee hearing last November was Sen. Sherrod Brown of Ohio, who grilled Vaden on his work crafting a voter identification law in North Carolina that a federal court said targeted African-Americans "with almost surgical precision" (E&E News PM, Nov. 9, 2017). "Was he the guy from Tennessee?" Brown said last week when asked by E&E News about Vaden. "We were not impressed."